Playing tennis is a fabulous way to get fit for so many reasons. Whether you are a competitive or recreational tennis player, chasing balls on the court will boost your cardiovascular fitness. A full match of tennis can burn a ton of calories making weight loss a lot easier. Tennis conditions your entire body including your lower body, upper body and core. Tennis will improve your hand-eye coordination. Running all over the court will improve your secondary fitness components including agility, speed, and ability to accelerate and decelerate. 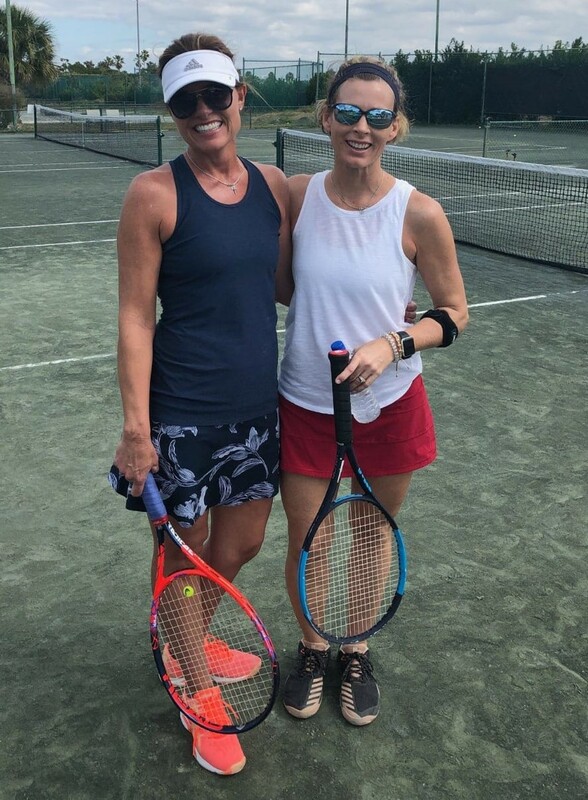 Tennis is such a fun activity to do with your friends and family making it a great, active way to spend quality time with those you love. You can play tennis at any age and ability. Whether you’re picking up a racquet for the first time or an avid player, you can find so much benefit and joy in the sport. 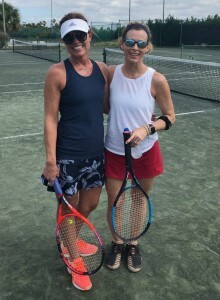 Although tennis is such a fun activity it can also be a strenuous sport with a lot of impact and force placed on your connective tissue so it’s a good idea to warm-up before a match and to condition yourself to be prepared for the demands of the sport. If you follow an effective sport-specific training and conditioning program, you can expect improved technique and power, making you a better athlete and resulting in improved performance. You’ll also avoid common tennis injuries, which mostly results from overuse, improper mechanics and a lack of sufficient flexibility and strength. By strengthening the muscles surrounding typical injury sites, you can strengthen the area and enable it to withstand the repetitive stresses associated with tennis. Pre-conditioning also allows you to handle longer matches at a higher level of intensity without getting winded. You’ll definitely want to strengthen your muscles in your lower body, upper body and core but agility is also extremely important in a tennis match. In your next strength training workout, perform four traditional strength training exercises, then one of the following agility exercises. Then another four traditional exercises, then one of the agility drills. Then another four exercises and the last agility exercise. Try to incorporate traditional strength moves like squats, lunges, chest and shoulder presses, back rows and pull-ups. But remember, since tennis requires the body to rotate in order to generate force during serves, backhands, forehands and smashes, be sure to include torso rotational movements and stability work for a strong core. Position 2 cones or props a few feet apart. Now quickly step laterally to the outside of one cone and back to the outside of the other touching down towards the floor on each end. Try to go as fast as you possibly can. Continue for 30-60 seconds. Stand in the middle of four marked spots, then sprint forwards to the top mark then back to the middle, shuffle to the left mark and back to the middle, backwards to the rear mark and back to the middle and finish by shuffling to the right mark and back to the middle. Do this for one to two minutes. See how many times you can return to the middle during the drill and try to get better over time. Position 4 cones in the shape of a rectangle so that the area within the cones is about 1/2 the size of a tennis court. Start at the base and sprint forwards staying outside of the cones. Now shuffle laterally. Shuffle backwards. Shuffle laterally. Reverse and go the other way. Do this for 1 minute. Take a 30 second break and repeat in the opposite direction. Check out the United States Tennis Association for more information on coaching, programs and tennis opportunities. Follow the local USTA Facebook page for Northwest opportunities. Note: As an avid Columbian reader, you can redeem a 2 week pass at her world-class training studio to help get you started. Contact 360.574.7292 for more details. Join us for the Spring Classic Duathlon & Home Depot Half Marathon, 10K & 5K! The Spring Classic Duathlon is a great opportunity for triathletes to shake off the winter-season rust and for the duathletes to get in an early season race. This long-running event is contested almost entirely on Marine Dr, which is closed to vehicle traffic – a rarity in the sport. You will ride and run right along the mighty Columbia River with beautiful views to make the time fly! Sherri McMillan, holds a Master’s Degree in Exercise Physiology and has been inspiring the world to adopt a fitness lifestyle for over 20 years. She has received numerous industry awards including 2010 CanFitPro International Presenter of the Year, 2006 IDEA Fitness Director of the Year, 1998 IDEA Personal Trainer of the Year, 1998 CanFitPro Fitness Presenter of the Year and 2005/2006 ACE Fitness Educator of the Year – Runner up. As a fitness trainer, fitness columnist for various magazines and newspapers, author of five books and manuals including “Go For Fit – the Winning Way to Fat Loss” & “Fit over Forty” and the featured presenter in various fitness DVDs, she is a spokesperson for Nike, Twist Conditioning and PowerBar. She has presented hundreds of workshops to thousands of fitness leaders throughout Canada, Australia, Mexico, Jamaica, New Zealand, Germany, England, Spain, South America, Asia and the U.S.A. She is the owner of Northwest Personal Training a training studio in Vancouver, WA and can be found running, biking, or hiking with her daughter Brianna and her son Jackson.